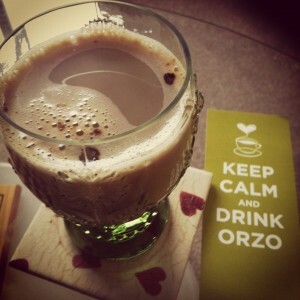 Keep Calm & Drink Orzo is what they say… but is it true?! Well, I think so! 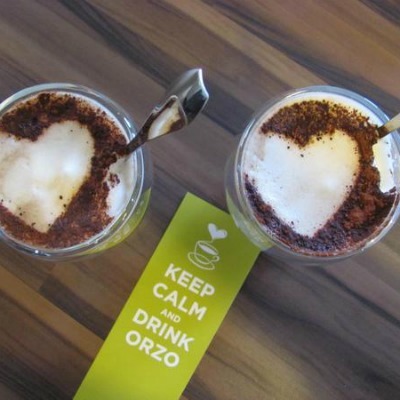 I hadn’t heard of Orzo until they followed me on twitter and I have to admit that I was rather ‘hesistent’ at first about trying their product “Organic Instant Soluble Barley”, ‘Italy’s favourite alternative to coffee’.. but I needn’t have been!! After I’d tasted it I instantly loved it and poured myself another cup.. *yum*. So, if you’re trying to cut down on your caffeine intake, or if you just want a new healthy hot (or cold!) drink to enjoy, then carry on reading to find out about this fantastic new caffeine free ‘coffee’! For the majority of healthy adults, caffeine in moderation (about 4 cups of coffee or 8 cups of tea a day) isn’t harmful. Drinking too much caffeine though can cause insomnia, increased heart rate, stomach upset, restlessness and irritability. If you can relate to these symptoms then you may want to gradually cut down on your caffeine intake (don’t cut it all out at once as you may experience withdrawal symptoms!). 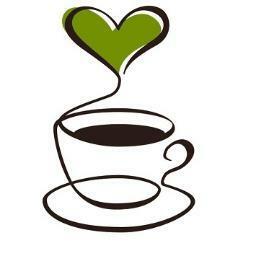 All coffee though, whether it is decaf or not, counts towards your fluid intake and helps to keep you hydrated. So how does Orzo fit in?! You can also make this coffee completely with milk for a latte which will provide more protein and calcium too (& you can also enjoy Orzo as an iced latte – scroll down!). 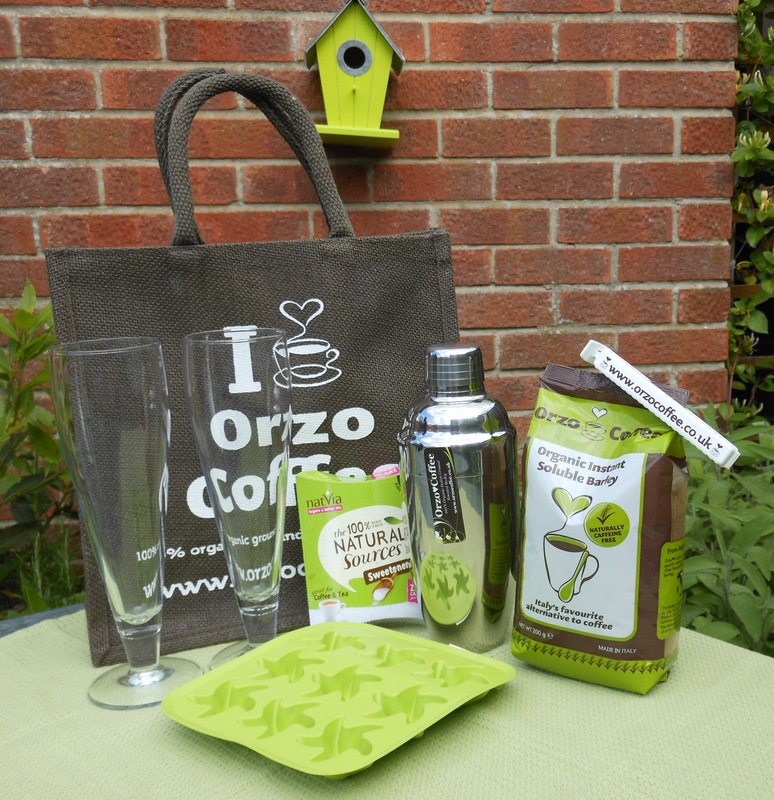 To celebrate summer, the lovely people at Orzo are offering one of my readers the chance to win this amazing hamper (details below), perfect for creating iced coffees.. and I’ve even created my very own sugar-free (& caffeine-free if you use Orzo) Skinny Iced Mocha Recipe which is DELICIOUS, to mark the occasion! ♥ One Stainless Steel Shaker – to mix your iced coffees in! ♥ Green Silicon Ice-cube Tray – to jazz up your ice-cubes! This giveaway will be open from Wednesday 7th August 2013 to UK residents (sorry!) for two weeks and will close on Thursday 22nd August 2013 at 8pm. The winner will be picked at random by a third party. The lucky winner will be announced the evening after the giveaway closes, at the end of this blog post and on Facebook & Twitter! *Samples of the product mentioned were supplied to me free of charge however this review is 100% honest and of my own opinion. I was not influenced in any way by the free samples supplied and do not promote this product more than other products that I have not reviewed. The products that I am giving away were supplied to me free of charge however I chose to do this giveaway based on the merits of the product itself (from a personal/professional point of view). I do not promote this product more than others that I am not giving away. Please read my disclaimer page for more information. 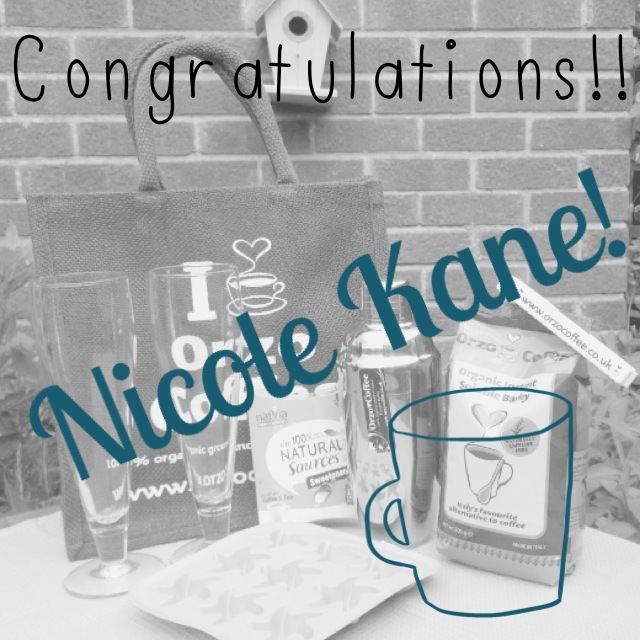 Previous Post Beanies Flavoured Coffee – Review & Giveaway! I like my coffee first thing in the morning, in bed lovingly made by my hubby! It’s my rocket fuel to kick start the day and my morning workout! My favourite coffee is winding down from work watching the kids playing after dinner. I love an iced coffee in summer when I get to relax in the garden and a regular hot coffee before college or I can’t keep my eyes open in my first lesson! Mid morning coffee (either hot or iced) with a banana, perfect for that elevensy snack! Plus it’s a perfect energy boost and pick me up prior to lunch! love a coffee with my friends! anywhere anytime! Before work to make sure am focused and ready! I love a( decaf) coffee when I have sugar cravings! Love a skinny cappuccino to perk me up during a mid-afternoon slump! Love a skinny cappuccino to perk me up during mid-afternoon slump! Whenever the mood takes me but especially after a thrashing at British Military Fitness. Skinny gingerbread latte at Christmas time! 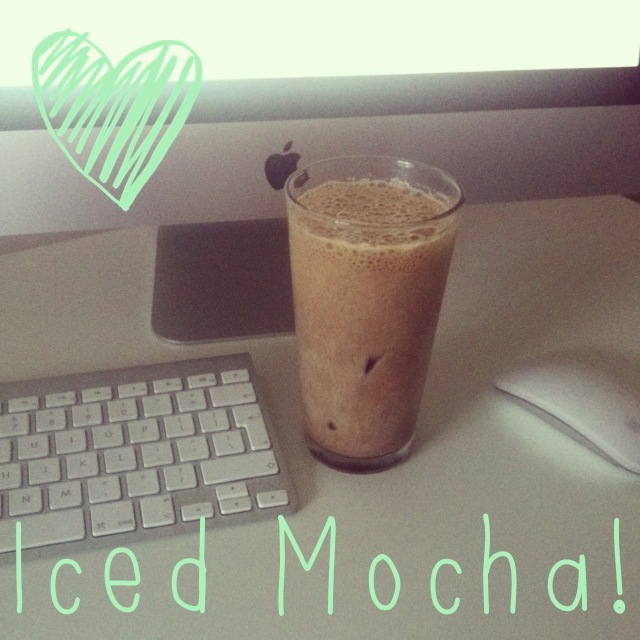 I love an iced skinny mocha in the mornings. Turning that into a hot coffee for the winter!!!! Love a coffee before the gym, double expresso topped with ice ,coconut water and frothed almond milk! Delicious!! Ideal hydrating pick me up to get me through my work out! After the gym/swim before I start my day. I love the boost from the caffeine and cocoa satisfies my sweet tooth. Plus, works out cheaper than buying one every day and healthier too! I love a Black coffee or with coconut oil about an hour after waking up, needs to be high quality. Hot days you can’t beat an iced coffee and some textbooks or reading in the sun. Has to be Saturday morning, sat around the kitchen table chilling out and reading the papers! My favourite time to have a coffee is in the winter after a busy day when I’ve worked out at the gym, rushed around to do my Christmas shopping, and I can finally settle down and warm up with a piping hot milky latte on the sofa…bliss! I love and need a coffee first thing in the morning after a sleepless night with the kids and before a l go for the morning run with the dog! Huskies just keep going, good for me though. I like a coffee whilst camping, kids asleep inside, me and hubby outside – wrapped up, in the dark….. With Baileys instead of milk! You just can’t beat that first coffee of the day! Good kick up the behind to get you going! Cold when it’s hot and hot when you have the chills! My favourite time for a coffee is Saturday morning before I start my chores. Gets me off to a great start! 1 tsp coffee, a small amount of hot water topped up with lots of warmed soya milk to make a Soya Latte. Manor Organic Farm, in Long Whatton, they have a new tea room, it’s the perfect place to enjoy a nice drink and coconut slice, any time of the day. I love coffee full stop at any time! But an iced coffee for a long car journey or on a hot afternoon is something I love, especially with good company! Even better when I mix some vanilla protein powder! I’d love to try the caffeine free alternative. Love to try all things new in general, especially coffee Mmm. Love your Twitter posts! I love to drink my coffee in my favourite Italian cafe soaking up the ambience, but I only drink decaf now as I cannot tolerate caffeine unless it is a home-made iced latte. And on that note I adore drinking my home-made iced latte in the garden on a hot summers day with a good book. Either in the car on the way to work, at work or as a pre-workout… Maybe some de-caf Orzo is required after reading that sentence back!! I love a coffee chilling in my garden / living room (depending on weather) with my kindle after a long run. There really is no better mid-morning break than a super strong espresso with coconut milk, sat in the sunshine soaking up the rays to remind myself how lucky I am to be healthy, fit and happy!! All day,every day,I drink a lot of coffee and I even have a cup before I go to bed. My favourite cup of coffee is the first one of the day to wake me up in the morning! Coffee with friends at the weekend having a good gossip and a catchup, recent discovery that I love iced coffee means this is what I always get now!! I love the fact that the aroma of the coffee cover up all those sickly medicine taste and give me the strength to fight my illness. I mostly enjoyed my coffees at the hospital with my lovely husband ^_* My dream is to open up my own cafe, seeing all those people coming from different city to drink my own made coffees and seeing them enjoyed as well as i do is my best fulfilment. A decaf coffee just before bed as I sit outside watching the stars. I love a skinny decaf latte over a a good gossip and catch up with my mum! She lives in Cardiff and I’m in London so it doesn’t happen often enough! Coffee is the first thing I think about when I get up in the morning! I can’t function without it! love an iced coffee in the morning whilst having a shower, during the summer and a steamy hot one in the winter. What can beat that first coffee in the morming – Ideally sitting on the patio in the warmth of the early morning sun.. I love a cold-brewed iced coffee on a warm day. So refreshing! In the morning before the gym in a banana and oat breakfast smoothie! In the middle of a twerk-out. I love my coffee iced, spiced, anywhere and everywhere! Being a full time college student and retail manager definitely calls for some (healthy) GO JUICE! Still enjoy iced coffees at home and on holiday as a refreshing treat too! I LOVE hot coffee first thing in the morning to start off my day, or decaff after a long day. I also like coffee when catching up with friends, or an iced coffee as a nice refreshing treat.. LOVE your mocha recipe!!! Mine’s a black decaf in the evening with some dark chocolate – yum. Orzo needs to become more available in shops! Especially for people like me who can’t tolerate the chicory in other coffee alternatives. Did you know that if you have an allergy to birch pollen you might cross-react with chicory?? You learn something new every day!! Thank you!! I am a morning coffee person, my favourite is a mocha! I like to have a coffee mid morning or mid afternoon with some stevia when I fancy a sweet treat but don’t want to indulge! This coffee looks really interesting! I also love have iced coffees all summer long….! I love my coffee, in the morning, iced at lunch time, night time coffee, all the time coffee! Unfortunately I’ve had to cut my caffeine intake right down in the last week and I’m really missing it!! I look forward to finding orzo!! The best coffee of the day for me is the first one I have when I get to my desk at work. A strong coffee sets me up for the day. I work on a chicken farm & my first, & most definitely my favourite cup of coffee is at about 6.30 in the morning, sat outside the barns, before starting work. I just sit quietly & watch the rabbits, sometimes a fox goes past, we have 3 muntjac deer that live in the woods on the farm & loads of owls. It’s just lovely to watch & that first coffee really sets me up for the day!! Cafe Atma. Spanking gorgeous pal.